I arrived Ehrwald (Austria) late in the day and I drove directly to the base of the cable car station. There I was informed about the fire, and that the cable car station had been closed for many months. In fact I didn’t care, because my plan was to scale the peak by fair means (using my own legs). According to the map posted on a big board outside of the visitor centre, there was a rather easy but exposed route to the summit. I also read it was a 1700m vertical gain in altitude, a demanding ascent by any standards. The campsite, conveniently situated opposite to the cable car station, seemed to include all basic facilities, thus I decided to stay there for the night. The next day I started to hike early in the morning, and the first part of the trail went through a green forest. After a while I reached a huge bed of rock, probably remnants from the great ice age when glaciers covered most of the Alps. Then I continued up a very steep hill where I gained altitude very fast. Higher up I started to traverse the mountainside, where the trail crossed some steep sections. Then I reached a mountain hut where I could see 5-10 people relaxing on the porch and obviously enjoying the sunny weather. Taking a short rest in front of the hut, I could study the last obstacle beneath the summit. The sheer cliffs (approx 300 metres high) seemed to be impossible to scale without a rope and other climbing equipment. But as I walked towards the cliffs I could see traces of a trail winding its way up the cliffs, aided with cables, ladders and metal spikes driven into the monolithic grey rock. 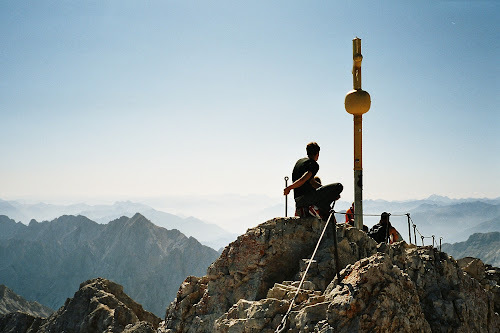 My initial plan was to climb Zugspitze by fair means, but when I moved my way up the ladders I had an awkward feeling of breaking some basic rules. But I had no other options, because I had left all my climbing gear in the car. I reached the summit plateau and the upper cable car station in less than 3 hours, walking into the inevitable anti-climax. The summit looked like a small shopping mall nestled on top of a ridge, utterly mobbed with people wearing casual clothing, and even women in short skirts and high heels. Most of the people had obviously arrived by a cable car, involving no physical effort at all, and when I had to mingle with those tourists I felt really uncomfortable in my dirty hiking boots and a sweat-soaked t-shirt. To reach the true summit I had to force my way through the crowds on the massive balcony of steel and concrete, and then scramble the last few metres to the summit crucifix. Luckily it was very exposed on the final summit ridge, leaving most of the people behind on the balcony.